Sony Electronics has announced an addition to its UWP-D series wireless microphone systems, offering improved sound quality with support for Multi-Interface Shoe (MI shoe) and a new digital audio Interface. Sony said the UWP-D series enables direct digital audio recording and delivers high sound quality with low noise by skipping the D/A and A/D process in combination with a new SMAD-P5 MI shoe adaptor and Sony’s PXW-Z280 and PXW-Z190 XDCAM camcorders. This will enable this capability through a firmware upgrade planned for September, 2019. The new UWP-D can provide audio information on the viewfinder for enhanced usability in the field. The new UWP-D series microphones includes an “NFC SYNC” feature, which provides a frequency setting between the transmitter and the receiver. The wireless systems’ reduced size and weight enable the mobility required for news, remote, documentary, sports and wedding production. Available in the summer of 2019, the new UWP-D series will include a body pack transmitter, handheld microphone, a plug-in transmitter and portable receiver. 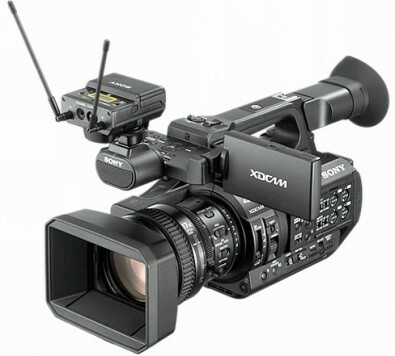 The new UWP-D series offers integration with Sony XDCAM camcorders, the PXW-Z280 and PXW-Z190. It shares audio information such as RF level meter, audio mute status and low battery alerts for the transmitters, and displays them on the viewfinder. Utilizing the SMAD-P5 MI shoe, audio signals are transmitted from the wireless receiver to a connected camera without a cable connection. Power is managed effectively because the wireless receiver can receive power from the camera, while the camera can synchronize power on/off with the receiver. With one-man operation by videographers becoming commonplace, simple and quick channel setting for reliable RF transmission is crucial. The new “NFC SYNC” feature is designed for easy frequency setting. By simply holding the NFC SYNC button on the receiver for a few seconds, it automatically scans for the appropriate frequency.